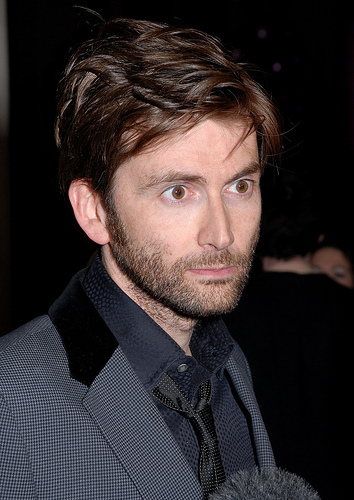 David Tennant attended the Legally Blonde Gala Opening on Wednesday 13th January 2010. Rather than a Press Night, the producers of the musicial invited the critics to view the play over a few night and then held a Gala Opening on this evening. The Gala Opening Party was held at the Waldorf Hilton Hotel in Aldwych, London afterwards. For posts about David Tennant at the Legally Blonde Gala Opening on Blogger.com click here. lauratkinson - "Things I have learnt tonight: Sheridan Smith is amazing, David Tennant is hotter than previously thought, Graham Norton likes small dogs." lauratkinson - "Jusy been hanging outside the savoy theatre loos with David Tennant." WestEndWhingers - "David Tennant standing by us. Think he's a bit shy of coming up to us. Bless"
ActionLamb - "Just asked David Tennant "where on Earth(or elsewhere in the galaxy) do you go after being the Dr" - answer "perhaps I should retire"!!!"